Climate Change? Here it is! Unpredictable weather, colder and hotter, wetter and drier. The only valid interpretation still remains ignored, precisely the answer given by Alex Podolinsky in a series of University conferences in 2012: the inability of soil impoverished of humus, to preserve water and the consequent acceleration of the water cycle, speeding the intensity of climatic phenomena. Humus is the bank of water with its capacity to hold back up to one and half times its weight. Soils cultivated out of Nature’s design lose humus, water flows quickly into the rivers causing floods, in the same year, after just a few months, sometimes even weeks the river goes dry, because it is unable to get fed from the venous system of the soil. Of course overbuilding, fast trains and roads do not help; their vibrations compact the earth and asphyxia “kills” the soils: without air, the aerobic microbiology present in it, dies. If only soils were cultivated following practices that are Life conscious, we could compensate the effects of economic development, slowing down water, holding back humus in the soil, which would feed rivers during summers. A solid farming practice, not utopia, based on Nature’s laws rather than on unrealistic and oneiric visions. So, following a cold winter with lots of snow on the mountains, a very warm April unexpectedly dry, closing with a week of freezing wind. Many olive trees, especially the Frantoio die or lose a branch. Followed by rainfall, rain and more rain. A busy spring, forcing us to spray vines even twice a week. At the end of June, while it rains all over Italy, Lucca goes dry! For 3 months, except a small shower in the middle of the harvest, on September 11th, a hot wind blows unrested at 30/35°C. It rains in Chianti, in Pisa; it even rains in Sardegna, but not a drop in Lucca! Harvest starts on August 28th and finishes as early as September 20th always under backing Sun. Grapes look like the 2017, not much, dry and light in weight, a very small yield per hectare, yield per must reduced to 50%. Wine is beautiful, fruitful, warm and enveloping, nice ripe tannins, but too little. October 2018. Where is wine distribution going? I used to love spending hours in bookshops, getting lost between the bookshelves, grabbing books, read entire chapters random, then sitting on the floor to read more…in the end leave the shop with a bag full of all sorts of literature. This can still happen in Torino, for instance one can linger at the Thérèse for a few hours, they are also good at suggesting; in Paris, I always try to stay around Montmartre so that I can wander in the Atelier looking for some unknown Emmanuel Carrère or strange comics , art books. Not to mention London where you need at least an extra day for the Daunt books in Marylebone… Although I regret buying online, I must admit that it is convenient, since Turin, London and Paris, are far from the hills of Lucca..
What about cinemas? How much longer will they hold? If Druetto (bookshop) in Torino closed in 2006 because they could no longer afford € 130,000 / yearly rent, Cinema Sport in Levanto closed because it did not have safety exits suited to the obsessive requests of inspectors lacking common sense; the cost of work to be done was too high compared to the turnover generated in recent years. It is all very sad, but here too, everything has changed; the choice is vast if you want to watch a film. Moreover, you can do so by sitting comfortably, even in your pyjamas, get up whenever you feel like it, smoke, drink and eat all at a very moderate cost. In case you have to interrupt the showing you may continue it some other time. In Lucca there they are two fantastic record stores, so vinyl shopping is fun, alternatively, I use the online Discogs to buy other less accessible LP. However, I cannot hide that streaming digital services like Spotify or Unidays are a paradise for music lovers, since radios are no longer what they used to be. What about wine? Italy is still a country where there are wonderful” enoteche”: endless shelves displaying bottles of all kinds. Cellars suitable for wine ageing scattered everywhere, from North to South, in big cities, in provincial towns, in the suburbs. The owners are passionate and you can buy wines to please all tastes and wallets. Do you need a crate of wine? All you need to do is call, and they’ll deliver it to you right away. Fantastic! What about abroad? It depends where. In many countries, it is similar, wine shops are always busy and business is good. If the alternative to buying in a wine shop were to buy “online”, the idea might seem bizarre, however, people choosing a bottle looking at a screen is increasing. We all know that fine wines are complicated to find, one must look for them amongst collectors, at auctions, book them or buy them “en primeur”, curry favour to some friend of a friend who might be able to find one or two bottles .. I hope that the enoteche will last longer than bookstores, more than cinemas ..
My suspicion is that it will very much depend on the distributors. 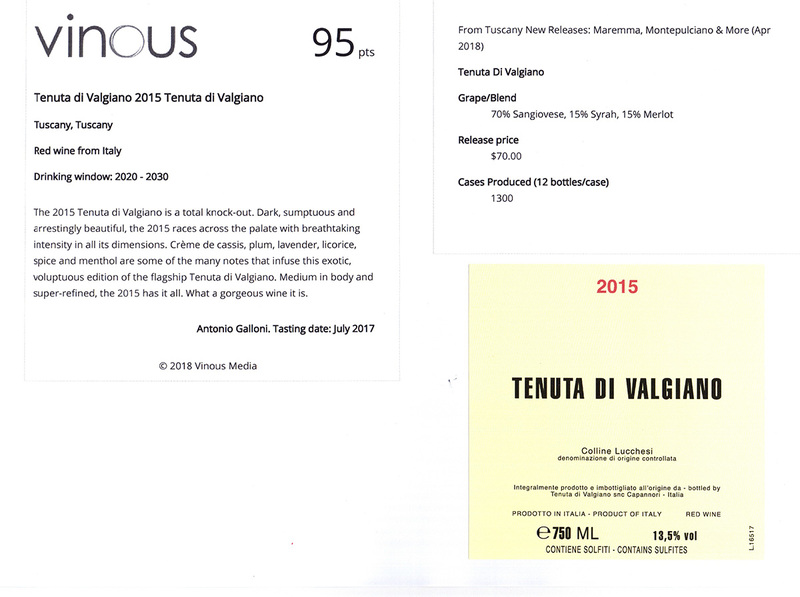 When a medium small winery like Valgiano does not get paid, by an importer/distributor who picked up the wines, sold them, re-ordered and resold them turning the vigneron into the financer of the distributor, something has gone very wrong. Analysing more closely, one comes to discover that the distributor in question has bitten off more than he could chew, and now needs a backer to help keep the boat going. Here come the wealthy gentlemen in support of the wine distribution, initially well intentioned. Later, one discovers that: 1) they have no passion for wine, 2) they behave like the most ferocious stock market shark strangling the vignerons by announcing them very long payments, and microscopic orders. In doing so, the vigneron, is forced to abandon those who have transformed a beautiful portfolio of small prestigious producers into a circus that will then turn only to large, industrial wine producers that can afford very well to be paid after 360 days. BTW the latter already sell online. January 2018, Justus von Liebig. On Friday, 8 December, it rained a lot in the Lucca area, incessantly. Around 4 in the afternoon I was climbing up the small hill, heading home, and I noticed that the water was flowing heavily along the little canals on the side of the road, at the foot of the walls. And in the olive groves, there the water was flowing out onto the street bringing with it dirt and mud, like little streams spit out by a drenched soil unable to absorb it all. But at one point as I was going up the hill… nothing; the road was no longer wet with torrents of excess water, the soil managing to hold it in naturally… Where are we? In a place where, thanks to a good management of the countryside, the ground is fertile, the humus layer keeps even the heavy rain under control. We are in VALGIANISTHAN. In Valgiano, we have been practicing biodynamic farming since the end of the Nineties; in particular the pragmatic method that Alex Podolinsky taught us, that entered into the fields effectively. This is why farmers at the beginning of the Twenties, preoccupied by the aggressive methods of modern agriculture and their effects, called on Steiner, who elaborated a biodynamic recipe to revitalize and restore the lands. June 2017. What do Seattle and Lucca have in common? Both towns have a tower as their symbol. Space needle was built in Seattle for the EXPO in 1962 and measures 184 metres. Two point three million visitors reach the top every year catching lifts that climb at a speed of 15 m/h, in 43 seconds approximately. Guinigi tower was built during the thirteenth century. It is 45 metres high. Two hundred and twenty thousand visitors climb every year 25 flights of steps summing to total of 230 stones, quite handy in the first part, but not the last, where it finishes in a narrow, tricky metal ramp. The average climb takes 15 minutes. It was built by the Guinigi family who ruled the town, the intention was to embellish their severe dwelling places with a tree-lined tower which then became the symbol of rebirth. However.. the average rainfall is what the two cities effectively have in common. Looking at the year 2014 – some might remember- endless pouring until April, followed by abundant showers towards the end of June and drastic lowering of temperatures. July and August were cold and humid, local newspaper headlines were quite dramatic; in absolute terms, Lucca was worse than the other Tuscan provinces; 1750 mm average/year compared to 833 average taken from the last 30 years. In Valgiano we measured 2010 mm of water in March..
Contemporarily, Seattleite’ city experienced heavy rainfall in February and March, adding up to a total annual rainfall of 1231 mm whereas the average yearly rain is 952 mm, and the dampest year was 1996. One could draw plenty of conclusions from these gloomy figures..or just stand back a little and admire plenty of different tones and shades of green that cover our hills as much those in Washington State! Maybe those Seattle boosters who in the old days have praised the city’s “seven hills” in a comparison with Rome,-to attract land buyers- should invent a new slogan by looking at the atmospheric similarities that Seattle and Lucca have in common. What about the wines? Few bottles were produced in 2014 ..finesse, elegance, 11% alcohol , even in Burgundy they tried to imitate us! M. Mantegazza Chef de Rang at Piazza Duomo Restaurant in Alba. Is there any room left for the wild ? Living in a place should invite us to enhance its welcoming beauty , to take care of it as a duty in order to return it in an even better shape; it should help us contemplate passion for harmony and for the the establishment of an ideal perspective. But in places where man has been heavy handed for an exasperating farming, the tree, the grass, the bucolic are an option; this is what happens where intensive viticulture is victorious: hedges and ditches are in the way as crawlers move forward, bees, vines “sigarai” , hares disappear minced or drowned in pesticides. Nowadays, the immediate, the abundant , the “all at once”, have become law and dogma. Revenue is wanted, plentiful and fast, and preferably with no effort involved. Instead we say : lets go back and be more moderate, for real, more simple, and more respectful! In the meantime, one pretends to be interested in environmental themes, in sustainability, as a result of which, “ protect nature” can be read even on polyester.. Nature is fashionable and when moda è moda, Gaber – Luporini used to sing, hence we jump on the naturalità wagon, on Candido mill wheel. Slogans are granted a privilege, the image and “terroir” – an over abused term- the location and site..but not in one’s backyard, with turfs, vines and an authentic dialect. We are against those who pollute the earth and wound it with settlements that clash with the surrounding environment; we are against antiseptic wineries , powdered wines and vassals, lobbies that, by appealing to the totally controlled, guaranteed and certified, destroy the soul of products and the essence of the rural and artisan world , erode the dignity of the landscapes and wineries. We are certainly not fond of a natural wine because it is cloudy: of course we have a preference for colours and aromas, although we accept the veiling, like the wrinkles in life. We think of wine, of the aliment in its nobility as enjoyment and delight. On top wine, there are other activities undertaken by those who farm in a healthy balanced awareness. Olive groves, vegetable gardens, orchards, beehives, farm animals, there are forests and if they are lucky to have an extra field, cereals will grow and alfalfa for rotation. Must not forget spots with weeds, where the wild can express itself, that is the way it should be! Two years ago an artist came to Valgiano as he needed some red and white wine for a set up: the Manger. Andrea Salvetti works with metals, all types of wood to make amazing objects both useful and splendid. He likes to mix his work with food and wine. And we’ve always had fun working with him! The trough was put hanging in a Restaurant in Lucca and guests were eating directly from it like horses or cows do, no hands involved. One could sip red or white wine from a personal straw coming down from the ceiling. Andrea also made 2 amazing BBQ tables, so beautiful that they would have fit perfectly in the dining room… he designed and constructed pots and pans using different metals such as brass, copper and inox, to go on the BBQ tables which were filled with charcoal. A steamer, bread pan, vegetable pan, and a magnificent copper bean to caramelize fruits. somewhere on our hills. He thought of Valgiano because we use horns in farming. And what can be said about the bulky column cemented in the plain, not far from here, 30 metres high, which advertises a fast food, apparently not so good for one’s health? Does the Town Hall receive complaints also about this column..debatebly attractive? How far do we travel every year to show our wines, pour them, tell the story of Valgiano and the territory where the wines are born. Working the vineyard, being a vintner is hard work and one has to run; the fruits we pick are different from one year to another, so are the wines. Across the table, at the wine tastings, many consumers, clients, fans and curious people attend and ask many queries. Do you do maceration, and for how long? Does fermentation take off spontaneously or do you add yeast? No one ever asks about the soil, which is one of the most important components of the wine, since the roots dig deep down through all the stratifications , whereas everybody asks what grapes are used. Wines from Valgiano are not varietal , they are “terroir “ wines. They belong to a place with a specific character, a personality, elegance, texture, consistency…it is not so complicated recognising a wine made in the vineyard -if well made- , from a wine built and made up in the cellar. It’s just a matter of trusting one’s palate, one’s tongue and the salivation one produces when the wine touches and runs on the tongue, in case of a “terroir” wine. Little by little, consumers begin to understand and tend to choose lively wines, those which express a landscape. We will never have the commercial power a premier Grand Cru from Bordeaux has, such as Hubert de Boüard who chose James Bond. Infact a bottle of Chateau Angélus can be seen for seven long seconds in Casino Royale, hence becoming the most popular wine amongst secret agents..But the wines from Valgiano are often drank by other vignerons, and many of them are French…they are our 007, without secrets! Most people seem astonished by this year’s excess sun and heat after they were amazed by their scarcity in 2014. But yet, it had been written somewhere! in December 2002, as the year was coming to an end, I read: “ …on July 16th Jupiter enters in the sign of Cancer ( Water) and this will carry abundant summer rainfalls, the harvest of autumn fruits will not be of much quality”. That was the first time I read the calendar 2003 paying a lot of attention to it. Jupiter was due to in the sign of Leo ( Fire) and the summer was expected to be torrid. For the first time, I was prepared to face the season even though I just couldn’t trust theses writings and forecasts..
13 years later, in 2014 Jupiter is back in the sign of Cancer, then continues in 2015, in the sign of Leo. We now store the consequences on our skin, in the cellar and the vineyard. Is it a coincidence? The Greeks spoke about them in their mythology, an ensemble of allegoric myths which describe the power of Nature. Jupiter/Zeus, the king of the Gods, rules in the skies; other Gods linger under him whimsical and volitive. They meet and fight in a whirl of forces constantly moving. It would be sensible to observe the skies at least when urban fog and lightings allow us to do so. Until the day I find a meteorologist capable of forecasting the weather one year in advance, I’d rather count on the stars . In the vineyard, very little light made it to the leaf canopy. Conveying grapes which had reached the correct maturity has been a difficult task, but, we –almost- made it! In Valgiano, the wines made in 2014 are different compared to a “classic” vintage, less sugar, therefore less alcohol. However, wines are balanced though they are characterized by a great vivacity ( or impertinence as they said once upon a time). The latter, is conferred from the natural acidity of the wine, as a result of the subtle fermentative transformations. The acidity ( or Vivacity) is the sublimation vector of the natural minerality of “terroir” wines. It entertains a very subtle relation ship with the mineral salts ( as they contain plenty of them) , with huge variability according to their birth place. act as aspiration effect of salinity. Hence it is the Vivacity that underlines the minerality of the wine, its salinity. The alcoholic fermentation, followed by the malolactic one undergoes subtle transformations which guarantee a noble vivacity to the wine who will chisel its consistency enhancing its texture. Vivacity makes the wine live in the mouth, it vibrates. At the same time, it enhances the aromatic freshness present in a climate or place wine, together with its style and minerality. but this wine is already sold out! Our bees have produced a new honey, so delicious that and it has been nicknamed Ambrosia, the Gods’ nectar. We are proud to present the Miele di Spiaggia (beach honey), which comes from the coast. The place is the Lecciona beach, part of the natural park of Migliarino San Rossore and Massaciuccoli. Here, the Thyrreanean waters wash the dunes and sand. It is the same sea that mitigates the climate in the vineyards of Valgiano. And, during the windy, “libeccio”days, the salt is blown all the way up on to the olive trees’ leaves. On these dunes, between the pinewood and the shore, the bees live and savour the delights of the flowers of the Mediterranean scrub and the helicrysium meadows that stretch almost all the way to the shore bestowing on the honey a unique aroma. This is how the Miele di Spiaggia is born, sweet, but also with brackish notes, a of amber liquid until the autumn, when medium size grains begin to crystallise, whose aromas remain unaltered like those that can only be found on this beach during the hot summer days. Searching for the etymological meaning of “sincere”, one finds the following explanation: The Romans used to order from Greek ceramists and vase makers big quantities of anforas for wines and olive oil. The inner coating of the vases had to be impermeabilized, to be precise, they had to be vitrified, to avoid seeping. The Greeks often took shortcuts, and , instead of vitrifying ( more costly) , they used liquid wax which they poured inside the container. After some time, the trick was discovered , because the liquid was coming out of the vase due to the porosity. By then, the Romans, who had become shrewd, would, when placing orders of vases to the Greeks ask specifically for them to be SINA CERA ; without wax. In practice, without tricks. This is where the word sincere comes from, meaning: without cheating. Sincere might not be the most appropriate term to define a wine, one would rather use it for a person ( though it is a rare quality) We like to “match ” Valgiano wines with the following qualitative terms: CONSISTENCY SOFTNESS VISCOSITY VIVACITY AND EXUBERANCE TEXTURE MINERALITY LENGTH AROMATIC PERSISTENCY COMPLEXITY These are the basis for the gel-sensorial tasting. Touching the wine by focusing on the way it feels in the mouth, on the tongue, and dwelling upon the salivation produced, one has access to the complexity of the place where it originates from. As Henry Jayer often used to say, wine is not made to be evaluated , nor to make a note of. It is not made to be smelled, but to be drunk. It was created by our ancestors to enhance the pleasure of staying together. It accompanies the most important rituals of living with others, from Platoon’s banquets to the friends’ tosses stroked up with “cheers”! 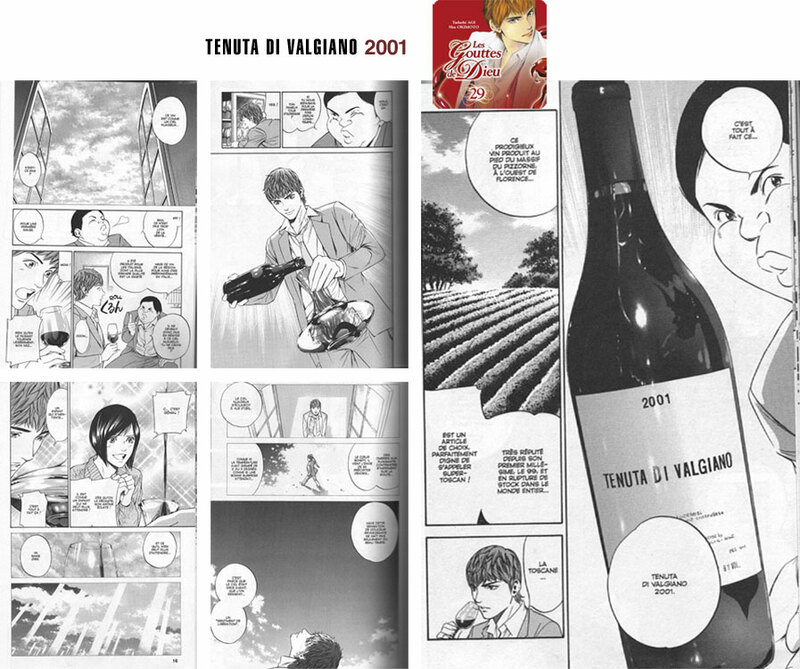 Hence, the wine from Valgiano is a “vin de lieu” , which belongs to a place, full of thousands of shades of ..rock! In Ancient Greece, land was assigned only to those who enjoyed the trust of the community, because that was where the food for all of them came from. For thousands of years, the farmer was he who practised labours useful for the fertility of the soils, not impoverish it. This system of land management lasted until very recently in the Lucchesia, in places like the Garfagnana, until the beginning of the 20th century. Land belonged to the community who entrusted it to different families every year, according to the numbers of mouths to be fed and the working arms; controlling the management and supervising making sure it would never impoverish. These were the rules until the arrival of the succession law up to the privatisation The result being: abandoned country sides, landslides and disorder. In Valgiano, we have taken charge of our responsibilities, the landscape resists, the woods are in balance with plenty of humus. Outside of the woodland, the farming soil is ever so fertile, farmed lovingly with biodynamic preparates, ( during these passed days the 500P). Several products are cultivated here, some more delicate than others; they can be enjoyed and tasted in the wine glasses, in the dips and dressings “pinzimonio” or baked , grilled (chicken, guinea fowl, geese) . Monica is the cheese maker just above our top vineyard ,with her 10 wonderful Kashmere goats produces all kinds of goat cheese such as the ricotta, the “erborinati”, “caprini” fresh and seasoned, which match perfectly the wines, olive oil hand honey from their same terroir. Still too early to judge the 2014 vintage..this suspense will fill us with unexpected surprises…to be continued..
Talking about the weather may be a British habit but when the season is so dull, it becomes a day talk even in Mediterranean countries. When will it ever stop raining? Bob had already asked an alternative question, in 1963: ” how many years can a mountain exist before it’s washed to the sea”? And the answer will not be given by time-waster meteorologists, “the answer, my friend, is blowing in the wind”..After a hot, dry and absurd April, the cold was back in May, slowing vegetation down. Hot and cold weather were alternated, leaving plants and people disconcerted; is it spring or still the winter that never came? In July the much longed for summer did not arrive, one could have called it Julyember. Continuously very humid, the few days of break from the violent downpours were useful to work the new vineyard: driving the stakes onto the ground, hoeing the grass, which seemed to be devouring the new vines still undefended. Milk with sulphur needed to be spayed rapidly, 501 early in the morning, and in the beginning of August, the Valeriana. Alex Podolinsky came back to Valgiano. Standing on the terrace, he delved into the horizon then departed, full of energy, for a three months tour around Europe giving lectures to careful farmers. When he returned, he was tired but satisfied. He said the best farmers are in Italy. For this reason we can say HURRAH for Italy! In March I went to China once again, the first few days in Hong Kong. I enjoyed the metropolis more this time; I was attracted by its orderly chaos. 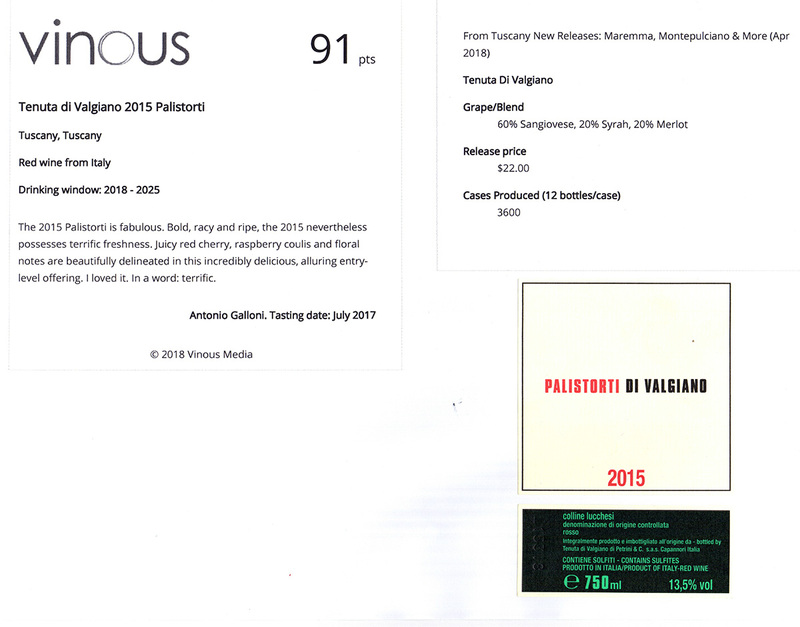 Valgiano was together with other producers, one from Barbaresco, the other from Irpinia. It was nice to work with them, piloted by our distributor’s staff. The next stopover was Chengdu, a “small” (14 million people) city in the southwest. This time there was just Valgiano for a very young audience. They had created a “VIP” event and I felt like I was on the set of a film on Liberace between the show, the luxurious cars, the festive table, the velvet jackets of the participants inlaid with gems and diamonds. Lots of photographs. Many asked me to take a picture with them “before I become red”, they said. People say that the Chinese do not have the enzyme to digest alcohol, and this causes their cheeks to become red. I had actually noticed this at some previous events. The food is very good in Chengdu, spicier, and its “hot pot” is very famous – a stew that reflects the Chinese habit of mixing different ingredients together in a large pot placed on a source of heat at the centre of the table where water and oil boil mixed with lots of hot spices. Unfortunately, I did not have the opportunity to taste their traditional dish but the wines were paired very well with other delicacies that everyone appreciated. As the evening wore on, I was looking for red cheeks but did not see reddish faces anywhere, not even among the most enthusiastic wine admirers. At this point, the ambience resembled more like the set a play by Li Yu. Conclusion: “Bevi sano, bevi Valgiano e non diventi rosso!” (Drink healthy, drink, Valgiano, and you won’t become red!)March. Springtime. The earth awakens. On the 21st, when solstice is over, the Tenuta di Valgiano 2011 wine, having passed its first winter in the bottle, hence sealed, introvert, magically opens up and expresses itself, strong and full of flavour.Beginning of April, Vinitaly: Valgiano is doubly present (a stand plus a ViViT spot). A concentrated show where one could get a taste of how the world is going. The ambience was composed, active, nervous, disorderly, combative, sometimes even cheerful and satisfying.It may seem like a frivolous destination, but from Verona, I went to Calcutta, to present several Valgiano vintages in the setting of the “Taj Mahal wine event”. The first place I visited in the City of Joy was the Kali Temple where I witnessed the daily sacrifice of the slitting a goat’s throat in the interior courtyard in honour of the goddess. I immediately felt drawn in by the many symbols of this divinity and, between good and bad, fear, repulsion, passion, suffering, a unique and unexplainable… positive force prevailed. February, 26th. New vineyard at Cesari and adult vines from Forci. Towards the end of December , we planted a twenty acres vineyard, where there once used to be the ” Scasso dei Cesari “. It was an installation made by thirty families, back in the fifties who used the “scasso imperiale ” method. This consisted in digging a pit one metro deep, planting the vine shoot then re-cover with earth. From Cesari we did the massal selection with Marco Moroni’ s precious help to re plant Sangiovese, Canaiolo, Cigliegiolo and Vermentino.Then we rooted out the old vine ( in 2010), planted wheat and cover crop to rehabilitate and bring the soil back to balance. For a couple of years a phenomenal flour was produced out of the Verna and Gentil rosso wheats and we made delicious pasta and bread from it. We are going to miss it! During the summer we broke the soil because the old drainage system was no longer efficient and needed restructuring.The other news is..Forci. Cancello, Orto, Santucci, Viani and Concetta are the names of the five vines that we have started managing since the beginning of the year after more than 15 months of abandon. The shoots resemble to liane, hard and entangled hence the pruning is a long and tiring duty.The ditches need to be fixed, as they can no longer hold water, there are patches where it seems more like a rice field. The Palistorti (crooked posts) in Valgiano are Palirotti (broken posts ) in Forci since we need to substitute more than 200 poles. Other than that, this hill is like a corner of paradise, an untouched landscape smooth and soothing made of woods and prairies, olive groves and few small vineyards. The position is ideal, so is the soil, partly clayey but mostly calcareous. In the mornings we can start working early as there is no heavy dew. From the Peak, Hong Kong can be properly seen, felt and admired. A twisting road reached up to it, but I took the tram, which climbs up hill steeper and steeper penetrating the tropical vegetation. A bit of air, finally! The warm wind blows from the huge metropolis underneath, swarming with activity amongst skyscrapers, ships, helicopters, chaotic yet tidy highways. Many distributors, tasters and curious people came to taste the wines at the International Wines and Spirit fair, (Nov 7-9) on the fifth floor, where Valgiano was in the Italian section, located next to the French. There, I met lots of people from China, Taiwan and India.Bye Bye HK, I am off to Shanghai, and my first day there was a Sunday, so I made my way to the market, where noiseless mopeds speed both ways and the pungent stink of fermented tofu attacks my nostrils; I am contented with a nice tea in a temple served with dumplings and sweet delights.In the afternoon, I am taken to the Muay Thai to do Thai boxing, (which I really liked), and later, a fantastic massage done by a blind man restores me. There I was, ready for an intense week of work organized, by Sarment ‘s staff that distribute the wines from Valgiano in HK and China.The timetable was filled up with appointments. For the moment, wines in Shanghai and Beijing are sold through Premium distribution channels. So we shall see if the sommeliers from the Four Seasons, Marriott, Ritz Carlton, or Park Hyatt will choose to introduce Valgiano on their wine lists; there is certainly a lot of work that could be done there…However, I can say that there was a lot of interest; I met many people who had a great deal of professionalism, they were curious, open minded, it was pleasant working and drinking with them, we spent some good times together. It is still a bit too early to say whether the trip was a success, but my overall feeling was that there has been some good sowing on a soil that had been properly and skilfully prepared…! How was harvest this year?It is still a bit early to say, we are usually carful before giving a final opinion. An exhausting harvest, and, in some ways, similar to the 2010… (rain?) Nonetheless, we managed to bring lots of healthy bunches to the cellar. Not so much the case, for the late ripening varieties such as Sangiovese. These are situated mainly in the lower vineyards, and suffered from the unfavourable weather conditions. Whereas the precocious grapes have come out nicely both in fruit and ripening. On the whole, we were proud to notice that the vine is in good health and has managed to defend itself in an extreme year as this one. It all started on September 5th, the team being, predominantly feminine. Once the grapes have been checked on the three selection trays, the girls step on the berries and name the tank they have processed. Summer has finally arrived. It seems only yesterday that we still had blankets on our beds, but the vines feel the heat, their shoots harden and turn yellow until they become wood, capable of going through winter filled up precious matter for next year.I wander around the vineyards that smell of sulphur looking for the first red berry, the scout that opens the track, the rest will follow massively. A stop in the spring run for a storm! We waited for spring but when it arrived, 15 days late, gosh! it was fast!You could see the shoots and grass growing, you could almost listen to the growth! Shoot-thinning, mowing, spraying 501, rain, first spray with milk only, broken tractor, broken quad, second 501, rain, second spray milk only, shoot-thinning, mowing, broken tractor, broken quad, broken mower, rain, third spray milk and sulphure, shoot-thinning, mowing, third 501…. And so on…. How many millimetres of rain fell during the months of December and January? 240 mm + 217 mm (total rainfall = 457 mm = half a meter). How many landslides occurred? Quite a number of them here and there. A couple of miles south from our hill, an important road was closed because half of it collapsed in the water stream under it; on the hill in front of Valgiano, part of the driveway to a nice Villa perched on top of the Uliveto slid down the slope. The local, regional and other administrations who had been duly called beforehand and, after the disasters, emitted feeble communications that clumsily bounced from one office to the other saying…there is no money.. At least our soil is healthy, it is strong, well maintained, it is … alive! So let’s have a nice glass of Palistorti! The flight to Tokyo is long; fortunately at Narita airport everything is easy and within a couple of hours I am at the hotel; it is 2 pm but I must stay up until the evening to avoid becoming slave of the jet lag this side of the equator… I spend the afternoon wondering in the Hotel’s neighborhood, (Idabashi), where there are many little shops with lots of tiny sweet things, incenses and hand painted cards, paintbrushes, oriental clothing, hundreds of japanese restaurants, but there is no chance of having some tea… coffee of all sorts; european, american ecc, finally in the evening I bump into a tearoom, where I sit to drink a super green tea which tastes of seaweeds and Cypresses, so good!The day after I am very well after such a good rest, (I’ve slept 12 hours), I meet up with Giovanna Piasentin e Yoshiyuki Kawazu, with whom I have been working for the past ten years, and we go and have rice in the Chinese district. We then move onto visiting clients with Kondo, sale responsible of my importer, who has organized for me with the help of Giovanna and Yoshi 3 days filled of appointments, tastings.The same evening we’ll be at the Perbacco restaurant, fully booked, where the chef, Dong, has prepared a dish to match every single wine, which means 10 wines, amongst which “Giallo dei Muri” 2001 in splendid shape, I could have mistaken it for a Montrachet (hear!hear!) … there’s also a risotto with a local type of root similar to Topinambour, where one must add the oil from Valgiano… Once the dinner was over, everyone asks me to sign the bottles, so I started drawing stars, drops, clouds, mountains, hearts on the bottles, then they ask me to do the same on the window!Kondo collected orders… Giovanna translated my presentation; yes, I was “LOST IN TRANSLATION”.It was a wonderful evening I hope to go there again, soon! !The following day, November 13th there was the “Renaissance des Appellations” tasting, the french producers were in two rooms of the hotels whereas Italians, Australians, Georgians, Spanish and Austrians were gathered in other building badly indicated so few people came, at least they were good ones and I was well represented since Giovanna, Yoshi and Kondo were at my table. I also had a chat with a journalist who is writing a book on “natural wines”, and I immediately told her that she must change title, fortunately she seemed quite open-minded.The day after, Giovanna, Yoshi and myself left for Osaka on a beautiful super fast train that travelled 500 km in 2 hours. Half way through the journey, I saw mount Fuji, magnificent and immense, it really looks like a volcano and the top was sprayed white with snow, there’s definitely something magnetic about it… Kondo came to pick us up, and off we went visiting clients until the evening and the last happening was at the Cantinetta Barbera, situated in the “naughty” area of Osaka, a tiny place where the chef cooks delicious to match the wines chosen by the mythical sommelier Mori. The place is packed and the atmosphere as often happens in Japan, is slightly tight, formal, serious, then gradually warms up so that all the commencing bows mute into hugs and friendly exchanges. The first five RED leaves have appeared today on a vine shoot in the Scasso di Cima vineyard: It is autumn. The air has cooled down, rainfalls are more frequent. At last, we sleep better because all grapes have been picked. The last boxes were taken to the selection trays on September 25th. It all started August 21st. The harvest began in a torrid heat to end up in medium fresh climate. The crop this year was not of excessive quantity; the early varieties have suffered more from the drought , hence giving a lower yield, but there was no withering , and, the other grapes, like Sangiovese, have given good yield …now that it has all become wine, we can sigh with relief. Ci abitueremo mai a questa alternanza di piogge torrenzialiseguite da caldo siccitoso?Per fortuna le viti sembrano fatte apposta, per più di 40 giorni hanno continuato a crescere con l’umidità accumulata dall’humus.Adesso la parte fogliare è splendida, verde brillantesenza un accenno di sofferenza. Quando abbiamo deciso di aprirci un po’ di più alle visite non immaginavamo questo!Un pellegrinaggio, ristoratori, enoteche, appassionati.Da una parte è gratificante ma il rischio è che ci si perda in chiacchere e si lavori meno. Che effetto ritrovarsi dopo un inverno alpinofreddo e secco in una primavera tropicale.Le piante crescono, i funghi imperversanoe noi corriamo.